Considering the fact that he was born in a hot air balloon at the Paris World Fair in 1878, it is not surprising that Conor Broekhart is obsessed with flight and the possibility of building flying machines. He lives with his parents on the island of Great Saltee, off the Irish coast, where his father Declan serves as the king's bodyguard. His best friend just happens to be the princess, Isabella, and the two of them get into all kinds of trouble together. Then one day, when Conor is fourteen years old, his idyllic life on Great Saltee changes dramatically. Purely by chance Conor is a witness to the murder of the king . The murderer is Marshall Bonvilain, the head of the king's military, and he is planning a coup and intends to blame the king's murder on Conor's beloved tutor. Unfortunately, the marshall sees Conor, and before Conor can do anything to help himself he is arrested, beaten, and taken to the prison on Little Saltee Island. His parents are told that Conor was killed in the fight and that his body was disposed of by the villain responsible for the assassination. The prison on Little Saltee is a terrible place. Luckily Conor's cell-mate, a blind musician, is able to advise Conor, and despite everything the boy survives. Not only that, but he builds alliances with other prisoners and he squirrels away some of the diamonds that he is forced to dig for in a mine. After two years in the prison, Conor finally comes up with an escape plan. On the day of Princess Isabella's coronation Conor escapes from Little Saltee by hanging beneath a festive fireworks-filled balloon. By some miracle the young man survives his first experience flying and he is able to get to London where his Little Saltee connections make it possible for him to get help. Conor is not quite ready to move on to a new life however. First he has to go back to Little Saltee to retrieve the diamonds that he buried there. Then he will leave his old life behind for good. To get on and off of Little Saltee Conor builds a glider, which allows him to become a bona fide "Airman." What Conor does not expect is that his ties to his old life will not allow him to leave Saltee to the tender mercies of the marshall. Instead, he is called upon to do what he can to save the lives of his parents, his new little brother, and Queen Isabella. 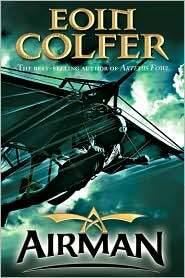 In this extraordinary book Eoin Colfer has created a unique story that is packed with adventure, thrills of all kinds, and a sprinkling of romance. Watching Connor grow up and change is fascinating, and very little turns out as one would expect. Readers will find it neigh on impossible to put down this book once they have started reading it.